Supports data recovery from both iPod Classic and iPod Shuffle. 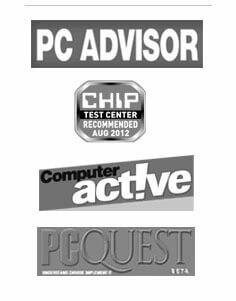 Supports WIndows 8, Windows 7, Vista, XP, and 2000 with easy 3-step recovery process. Preview the video files, documents and images before actual recovery. iPod data recovery software helps you to recover the data, which you have lost due to corruption in your iPod. The software can recover all types of data stored in the iPod including audio files, video files, images, pod casts, ebooks, documents, etc. There could be different reasons due to which the data stored on an iPod may become inaccessible. 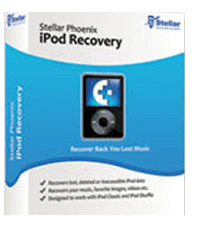 In such a case, you need to execute Stellar iPod recovery software to gain access to the lost data. The software has been designed to work on Windows operating system and there is no need for MAC as well. Just connect your iPod with the PC or Laptop on which the software is installed and then scan your iPod using this iPod recovery software. During the scanning process, the software will look for all multimedia files and other files that could be recovered. And, after the scanning process is over, the software lists all files in folder/sub-folder/files like structure in its left panel. You can select and save these files to get access to the lost data. The software has been developed to recover all types of files stored in the iPod in their original formats and with all their properties. While ensuring that you get everything back in its original format, the software ensures that your time is saved as well; hence, it works faster using its new scanning engine. With the help this software, iPod recovery has become as simple as Step 1, 2, and 3. Install this software, scan the iPod, and save the data. That’s all and you will have all data back in their original formats and with all properties. Quick recovery: It is good to recover data as soon as it is lost. With this option, you can recover lost data in a few minutes depending upon the amount of the data to be recovered. Deleted file recovery: It is good to recover files that you have recently deleted. Advance recovery: It is an advanced recovery mode, which helps you to perform an extensive recovery. As this mode is slow, you should use it only when Quick recovery mode is not much helpful. Software helps you to preview the files, which you can recover. Preview feature is helpful when you want to save only selected file rather than all data. Apart from the preview feature, you can use the filter or find options to locate required files that you want to save. Software provides you an option using which you can save scanning information. This feature is helpful when you need to leave the recovery process in between due to some urgent work. And, when you are back, you can resume the recovery process using the saved scanning information. This feature saves a lot of time. Create Image is a bonus feature of the Stellar iPod Recovery software. With the help of this feature, you can create an image of your iPod, which will work as a backup for you when data stored on the iPod is inaccessible. iPod data recovery software can be installed on machines running on Windows 7, Vista, XP, and 2000. Directly connect iPod with the machine and recover all data. There is no need for Mac. The software can recover data from iPod Classic and iPod Shuffle.